The process is reasonably easy but quite time consuming because of cooling and refrigeration a couple of stages of ‘construction’. For this reason the original recipe from The Women’s Weekly requires shop bought shortbread rounds- I think it’s worth spending the time to make your own, though, as the home made shortbread is what really makes these biscuits special. 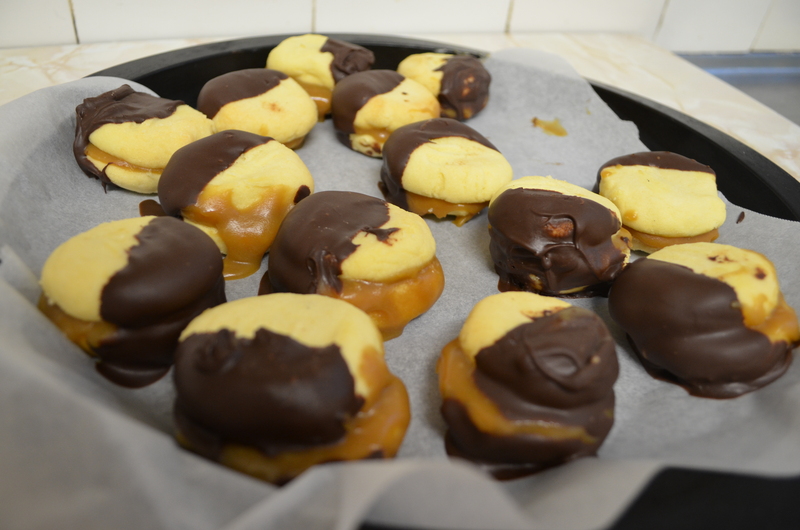 I find a good way of managing my time with this recipe is to make your biscuits and caramel the night or morning before you need the biscuits, and then come back the next or later in the day to fill, chill and dip them. 1. Preheat oven to 160 C and grease and flour two oven trays. 2. Beat (soft, not melted!) butter and caster sugar with electric mixer until light and fluffy. Stir in the water and flours in two batches. 3. 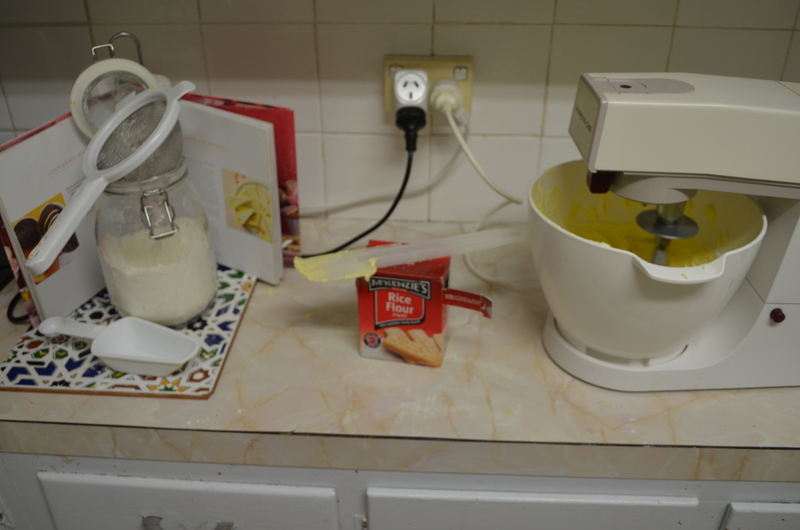 Turn the mixture out onto a floured surface and knead until smooth. Roll into tablespoon sized balls and flatten slightly with a lightly floured fork. 4. Bake about 40 minutes or until just beginning to turn golden brown around the edges. 5. 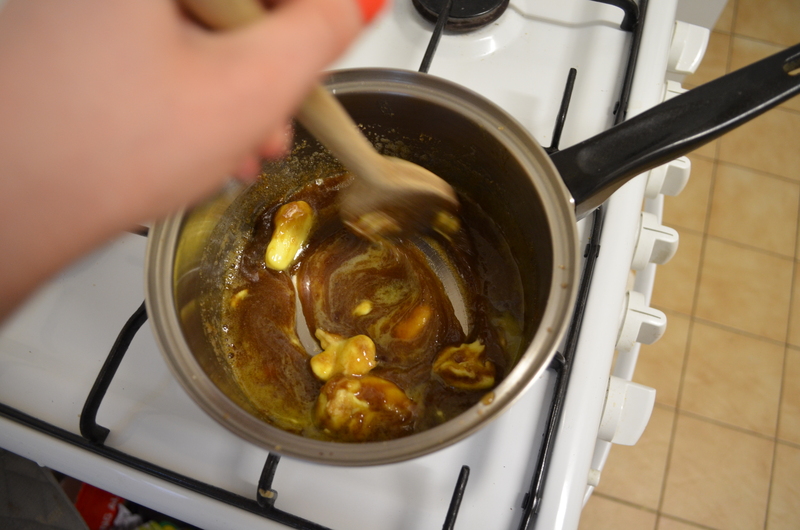 Meanwhile, make your salted caramel filling. Place the sugar, chopped butter, water and half your sea salt into a small saucepan and heat until the sugar is dissolved. Add milk mixture and stir until it boils and thickens. Remove from the heat and whisk in egg yolk and vanilla. Allow to cool for ten minutes before tasting, and add more salt flakes to taste, if required. 6. Place in a bowl and cover with clingwrap and refrigerate for at least 3 hours. 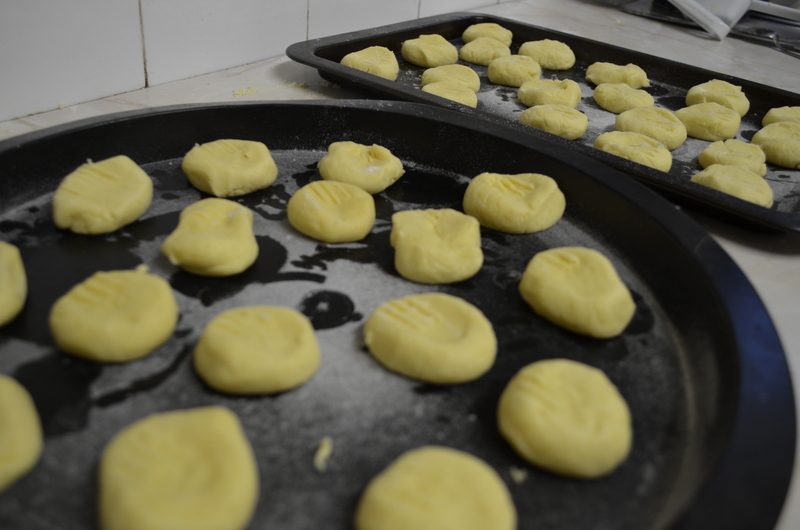 Remove cooked biscuits from oven and cool on trays. 7. Spread caramel over half of your cooled shortbread and sandwich with remaining biscuits (I try to size/shape match my pairs before putting them together). Cover and refrigerate for 1 hour (I do this on a cooled tray). 8. Melt chocolate in a small bowl over a saucepan of boiling water (without the water touching the underside of the bowl) OR if you’re game, in the microwave in short bursts at medium heat. Remove from heat and stir in oil. 9. 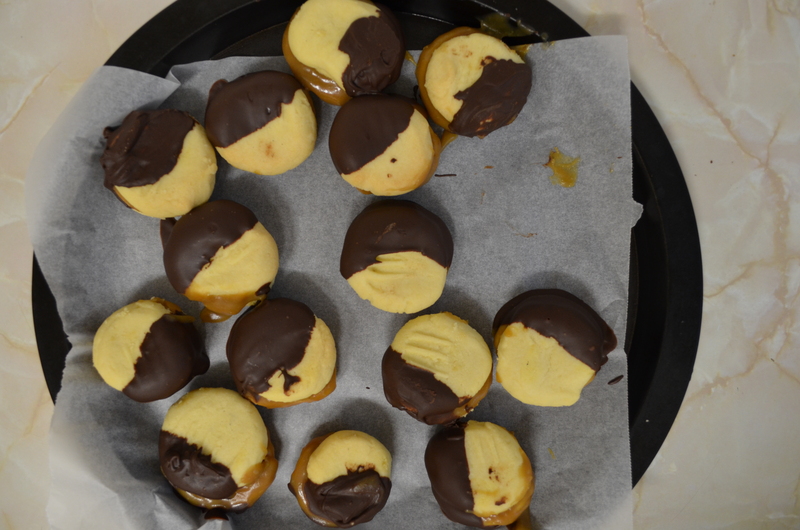 Dip one side of the cold cookies into the melted chocolate and stand on baking paper, at room temperature, until set. When set, feel free to pop them in the fridge, they taste super good either temperature. So! As you can see this one is a bit of a lengthy process. I promise you it’s worth it, and you can easily work the different stages around the rest of your day (I went to the gym and then came home and dipped them in the chocolate. Dangerous. Tasty). 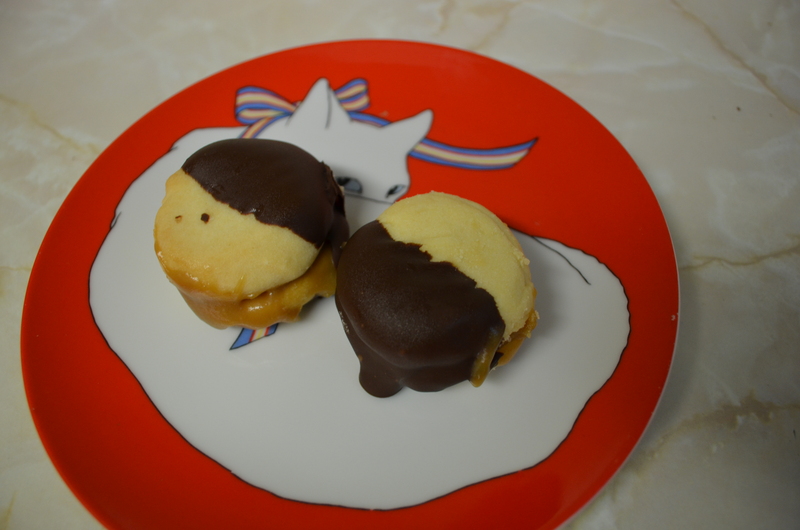 These are great at a party or to take as a sweet treat to a friend’s place. Have fun!